After finishing the Dirty Duo 50k, I was inspired to read a little bit more about the great wide world of Ultra running I had just become a part of. It was during this search that I found many articles with advice on how to train for your first 50k, and what not to do before your first 50k. I chuckled as I read, thinking to myself that it might have been a smart idea to look this up BEFORE my race. My favourite piece of advice by far was a gentle reminder to have everything ready a few days prior to your race, so that the night before can be nice and relaxing, and you aren't running around stressing out about not having everything, or not knowing where you're going. Coming in to the finish line with a smile on! Here's how my pre-race prep went. 7. Finally calm down, realize I've run the majority of the route, and settle on bringing all the rain gear I own in a drop bag. Despite a chaotic night before the race, the morning of the race went well. We ate our usual pre-race rice (It's liquid gold pre-race - you should try it), and we were on our way. I took the beginning of the race fairly slowly, knowing I had a better chance of running pain free if I paced myself. I settled in near the back of the pack with people who seemed more than happy to walk the hills. It was a nice warm day out, and there was no rain to be seen (YET!). It wasn't long before I took to running the hills (Still pain free! Woohoo!). I continued on, motivated by a girl ahead of me who was running all the hills. There were a few where I wanted to stop and walk, but its always motivating trying to catch someone! I had planned to eat every hour to start. Which worked for the first two hours, and then I lost track of time and just ate when I felt hungry or tired, and that seemed to work well enough. One of my favourite parts of the day was eating a vanilla clif shot from the second aid station, and realizing it tasted just like vanilla pudding. There is nothing better than running around in the woods while eating vanilla pudding. There's another one of those things you shouldn't do in an ultra - do not eat new foods for the first time during a race... EXCEPT when they taste like vanilla pudding. Jenna: 1 Ultra: 0. I got to the nasty uphill section (aka the hill that never ends) feeling good, at this point it was starting to drizzle. I ran where I could, and walked when my glutes wouldn't let me run anymore. Then came the technical downhill section - Ned's Atomic Dustbin. I have to thank Chris for this again, usually I'm chasing him down this hill trying not to trip and fall and die as he barrels down like he's indestructible. This time I was the machine! I flew down there with no troubles and no pain, ready for my second lap! 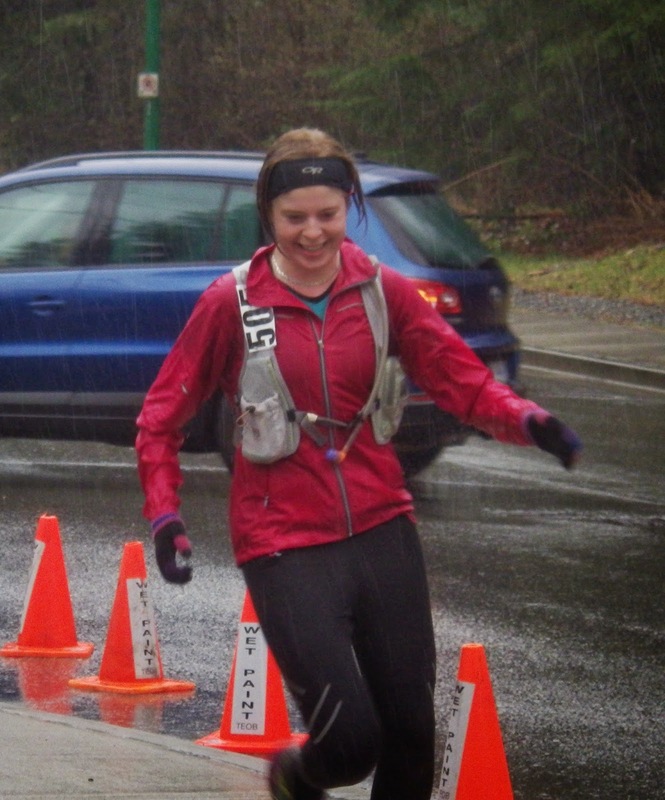 It was at this point I decided that a 25 km race would have been awesome.... do I have to do 50? By now it was pouring rain and I hadn't seen any 50k runners in a while; I sort of felt like I was the only one out there.The last 25k weren't all that eventful. The hills were harder, and it felt like I was walking more of them. My energy was dropping fast as I approached the hill that never ends for a second time. Nothing a little sugar and caffeine couldn't fix though! I knew once I got to the top the rest of the race was downhill! The second lap was made more fun by the increasing rain and mud puddles on the trail! That isn't even sarcastic. It was like being a little child stomping through the muddy trails. I made it to the finish line in just over 6 hours, with the biggest smile on my face. I DID IT! You don't have to be superhuman to do Ultras, you just have to get out there and give it a shot (a vanilla clif shot...yummm)! s go let's go let's gooooooo! Hey Jenna, that's an awesome write-up! So suspenseful....I was waiting for the part where you felt like you were going to crash and burn or where the injuries would rear their ugly tentacles...but that never came. You really want to make me do that race next year...unless it rains of course!